Award-winning Liverpool FC blog. Match previews, match reports and regular opinion from The Liver Bird. Can Liverpool Take Three Points From The Saints? It's Southampton for Liverpool at Anfield tomorrow as Brendan Rodgers aims to get back to winning ways after suffering a defeat at the hands of Villas Boas' Spurs. It should be a win on paper for Liverpool on Saturday but many fans are remaining cautious with the difficulty of scoring still well and truly looming over the Reds. It's good news on the injury front for Liverpool as Lucas Leiva is back and available for manager Brendan Rodgers, it will be interesting to see if he plays what with Joe Allen in the mix at the moment and if he does start what sort of role/place will he take up? Joe Cole is also available again after recovering from a knock earlier in the week. Southampton are also lucky enough not to have many complaints team wise, only Danny Fox is a doubt after suffering a knee problem. It was a lively game at White Hart Lane on Wednesday night with both sides having several chances at goal, whilst Liverpool had to rely on the opposition scoring for them though Tottenham converted two chances very early on and were able to maintain their lead throughout the 90 minutes. Brendan opted to start once again with Henderson and Stewart Downing, pushing Enrique up front in the hope he would add to our attack. Sterling and Suarez were regarded as the main threat for Liverpool though going into this one. It didn't take Spurs long at all to take their lead leaving Liverpool pretty much shell shocked. Aaron Lennon was able to turn in a Gareth Bale cross after Bale broke with ease past an adjusting Stewart Downing. With barely a second to rest after their tie with Swansea this weekend the Reds make the trip to London on Wednesday evening to face Andre Villas Boas' Tottenham side. Liverpool have a strong unbeaten run at the moment in the league but find themselves requiring goals. Tottenham are unable to call upon striker Adebayor who is still out through suspension. Spurs also have a growing injury list with Ekotto, Kaboul, Parker and Benoit all out. Sandro is available though after picking up a stomach injury during their recent West Ham fixture. For Liverpool things are still pretty much the same. Encouragingly Lucas Leiva featured with the reserves this week but is still not ready for the first team and Andre Wisdom has recovered from a knee injury he picked up in the Europa League. Liverpool had to settle for a 0-0 draw at the Liberty Stadium on Sunday as Swansea held out the Reds attack and failed to find the net themselves. It was probably a fair result in the end but Liverpool did appear to have the better of the chances, unfortunately for Brendan's side though they were not converted. Liverpool had recalled Henderson and Downing to the starting line up after they featured in the Europa League and Brendan also decided to utilise Jose Enrique's presence in attack pushing him forward on the wing. It was a very balanced 90 minutes from both sides perhaps boiling down to the fact that both managers enjoy a passing game, it was so similar we cancelled each other out at times and it was always going to take something special for a lead to be gained. 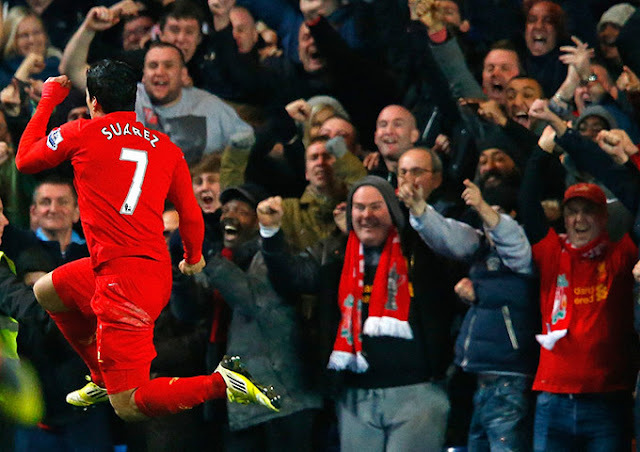 Liverpool are off to Wales on Sunday as they aim to chalk up a win at the Liberty Stadium. Brendan Rodgers became a god like figure to Swansea fans during his tenure but after the Welsh side picked up a win at Anfield in the League Cup, some Jacks were left wondering why they were so upset when he left. Injuries for Liverpool aren't really causing any major concern with the likes of Lucas and Kelly obviously still out and only Wisdom with a slight doubt hanging over fitness. For Swansea they've had three lads missing through illness; Davies, Graham and Moore (don't eat where they do) but manager Laudrup expects to be able to call on them for the clash on Sunday. The Reds had to settle for a draw with visitors Young Boys on Thursday evening after a very good performance with a bit part team nearly saw them take all three points and cement their place in the knockout stages of the Europa League. It wasn't to be that easy for Brendan though and the Swiss side found returns for both of Liverpool's goals. Brendan opted to start Jonjo Shelvey as a lone striker for this clash and the likes of Cole and Downing also got a run out too. Henderson also started but eventually ended up in defence whilst Luis Suarez and Steven Gerrard started from the bench. The game started with a shock for Liverpool after Young Boys produced an attack immediately and seriously dampened the mood, aside from this flash from the away side though they offered little to deal with in the first half and Liverpool had enough time to regroup after the initial effort from the Swiss side. Liverpool welcome Young Boys to Anfield on Thursday evening as they look to quickly get their Europa League form back on track. With two games left in the group the Reds face a real prospect of getting thrown out if they are beaten by the away side. On a positive note, Pepe Reina is expected to start and if he does he will become the goalkeeper with the most appearances in Europe for Liverpool, overtaking Ray Clemence. The two ties with Anzhi for Liverpool saw the Reds pick up a win at Anfield but lose in Russia. Perhaps an unexpected result but the Reds don't have time to dwell on their downfalls. A loss to Udinese hasn't helped their case either but their most comfortable performance came against Young Boys on their home turf. Liverpool managed to buck their ideas up in a second half against Wigan which saw them put three goals past keeper Al Habsi. Enrique cemented the win for the Reds but it was Suarez once again who stole the show with 2 goals and several chances of upping his tally. Reina was back in the starting XI for Liverpool and it was the three S's leading the attack again with Suso, Sterling and Suarez all starting. The game began for Liverpool in a similar way to the Chelsea fixture, a reasonably good performance but with no real chances or panache. The positive thing for Liverpool this time though was that no offence to Wigan but they aren't Chelsea and the Reds had also managed to ensure that despite not scoring themselves in the first half, they hadn't conceded either. The first half also saw a substitution with Henderson replacing Suso at 35 minutes. Liverpool face Wigan this weekend as the Latics make the short trip to Anfield. Steven Gerrard featured for England during international friendlies in the week making his 100th appearance and will captain the side on Saturday. Some good news for Liverpool this week in terms of injuries as Lucas Leiva has returned to training at Melwood and also Pepe Reina looks as though he may finally be ready to start between the sticks again. Jonjo Shelvey is also available after suffering a small thigh problem. For Wigan, they have a doubt hanging over James McArthur but long term absentee Miyaichi may be available for Martinez's starting XI. Wigan are currently perched just below Liverpool in the league in 14th place and a win for them would push Martinez's side above us. Wigan look stronger this season compared to last and after recording a win at White Hart Lane earlier this month they aren't a team the bigger sides should just assume they will beat. Liverpool were the visitors to Stamford Bridge on Sunday afternoon as the Reds looked to continue their good run on Chelsea turf. After a distinct lack of goals for Liverpool though and a recent lull in league form it was looking like a difficult task. Glen Johnson was brought back into the starting XI on Sunday but Pepe Reina despite travelling was left out after a late fitness test. Raheem Sterling was given a more forward role for this one sitting just off the lead man Luis Suarez. Liverpool are in London on Sunday to face Di Matteo's Chelsea and if the Reds want to walk away with all three points then they are going to have to hope Suarez is on form or somebody else fancies a pop at goal. Liverpool too many times this season have taken control of a game but then failed to score. Injury wise Liverpool are actually in a pretty strong position, discounting the long term ones there aren't any real absences and it looks like Glen Johnson and Pepe Reina will be fit to start for Sunday's clash. Chelsea on the other hand are missing Frank Lampard and Ashley Cole, John Terry will likely feature though after serving his 4 match ban. Chelsea have had a brilliant start to their league season and look as though they could be challenging for the title come May but they have taken some knocks especially recently after a draw with Swansea and a loss at the hands of Manchester United. Sadly it was the same old story for the Reds as they struggled to turn possession and control of the game into goals and more importantly a win. Anzhi utilised their big man up front Traore and took a lead which lasted the whole game at the stroke of half time, Liverpool just couldn't find a return. Brendan Rodgers had fielded a weakened side with one eye still on Sunday's tie with Chelsea but the familiar faces of Carragher, Shelvey and Henderson were present. Anzhi had all their big names on with Eto'o captaining the side. Liverpool began the game well (which I'm sick to death of saying) and appeared to be handling the more active attack of Anzhi. Chances were few and far between but at least to start with the Reds were keeping out Hiddink's sides attempts too. Liverpool are in Moscow on Thursday evening to face Anzhi. The Russian side rose to fame after being taken over by a millionaire but they are aiming to be remembered for more than just their megabucks as they look to get the better of the Reds in the Europa League. Brendan Rodgers has left several star players at home for this match, obviously wary of the looming tie with Chelsea on Sunday. Whilst the likes of Gerrard and Suarez plus several others have been left out, there are some less used youngsters like Morgan and Coady on the list. Liverpool are currently in a comfortable position at the top of the group but with Anzhi playing this fixture in the potentially daunting Lokomotiv Stadium (home of Lokomotiv Moscow) there could be a stumbling block on the cards. Liverpool had to settle for a draw with Newcastle at Anfield on Sunday as they struggled to turn possession and chances into goals. The Reds started pretty strongly but as always the opposition were allowed to break the deadlock. Brad Jones was in goal once again as Pepe Reina missed out through injury and the three S's, Suso, Sterling and Suarez were there to provide Liverpool with some attacking nous. The first half started positively for Liverpool, there was a lot of control and possession was maintained with ease. Sterling was causing problems for Newcastle whilst Suso and Suarez had a few attempts at goal early on. Newcastle are the visitors to Anfield on Sunday as Liverpool look to scrub away the memory of their Swansea defeat. Liverpool are unbeaten in 4 in the league but their performances have sometimes been questionable. The Reds still have doubts hanging over Pepe Reina and Glen Johnson who both still haven't fully recovered from hamstring problems whilst Newcastle are without midfielder Tiote. The last time the two sides met was on April Fool's Day and I remember being particularly annoyed after poor performance from Liverpool and a rather stroppy Andy Carroll. To find the last time the Magpies managed to notch up a win at Anfield though we have to go all the way back to November 1995. If the Reds win, it will be their first 2 wins on the trot at Anfield in over a year.Newcastle haven't won away in their last 8 attempts.Liverpool have conceded 14 goals, a Reds record for this stage of the season. Liverpool were knocked out of the League cup on Wednesday night by Swansea who have never in their history reached the quarter finals of the competition. A weakened side from Brendan Rodgers had to be strengthened with the likes of Gerrard and Suarez at half time but even the presence of stars couldn't hand the Reds a win. Swansea came to Anfield with exactly the right intentions; to attack. Too many teams come to Liverpool and don't feel brave enough to take on the Reds, especially in cup games where anything can happen and an away side will often rely on it's counter attack. For Swansea it was the complete opposite, they applied pressure from the whistle and had the better first half by far. Liverpool had youngster Yesil up front but he wasn't as impressive as he has been in some international fixtures we have seen him in, however, Yesil is certainly one for the future.